Sports Travel Agency arranges all matches, game fields, referees as well as match transfers for you. Enjoy to watch your players play the matches they will always remember, because international matches are always the most exciting ones. Your players will benefit from this experience in every possible way. You can decide how many matches you want to play and we will advise you and arrange everything. Having won two straight FIFA World Cup titles and eight UEFA European Championship titles women's soccer in Germany is booming. Now with hosting the next FIFA Women's World Cup in 2011 the absolute enthusiasm will reach its peak! Some of the best teams Germany has to offer are definitely waiting to play matches against U.S. or Canadian teams. Matches in the past have been really fascinating. Teams like FC Bayern Munich, 1. FFC Wacker Munich, 1. FC Nuremberg, TSV Schwaben Augsburg, FC Union Berlin and many more are available. Sports Travel Agency has got very good contacts to German professional clubs like FC Bayern Munich, TSV 1860 Munich, VfB Stuttgart, Eintracht Frankfurt, 1. FC Nuremberg, SpVgg Unterhaching, FC Augsburg, FC Ingolstadt 04 and many more. 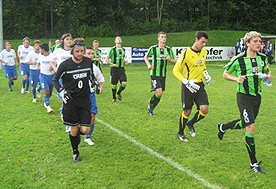 Furthermore, top teams from Austria like Red Bull Salzburg, LASK Linz or FC Wacker Innsbruck have already had their junior teams ready to play our visitors. We can set up matches for you against their highly prestigious junior and youth teams which are already fully used to professional or semi-professional circumstances. You should know that Germany's youth soccer system is well-known to be among the best in the world. German national youth teams, girls and boys, in recent years have become European Champions in all important age groups. That success is also reflected in Germany's club system. 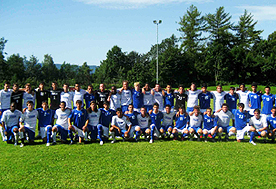 To have your club or university teams play against German youth or junior club teams will therefore be very exciting and can be a great learning experience.Also, in Germany in general, but especially in Bavaria and in the Munich area there is an abundance of teams of all age groups and all levels, so that we are able to set up exactly the matches you need to achieve your team and player's improvement.If the time of your stay is advantageous there will even be the opportunity to stay at the hotel with international teams from all over the world. Games can be set up short dated even on-site. Due to Daniel's playing experience in the U.S. and in Germany and his media and study work Sports Travel Agency has very good knowledge of both, the level of teams in the U.S. and the level of teams in Germany. Not without any good reason have all our clients especially been satisfied and thrilled by the competition we have offered them. Also, we and our clients consider it no coincidence that most of the teams that have gone on such an international tour have subsequently played an extraordinarily successful season. Especially College teams that are restricted in the amount of games they are allowed to play in the pre-season by NCAA or NAIA rules cannot prepare or gain their best shape in any better way than by playing such challenging games as Sports Travel Agency is able to set up. Also, the different style of soccer and understanding of the game in Germany will extend the knowledge of the game of all your players. If specifically asked for and with sufficient time in advance we can also set up a tournament participation for you. The availability of tournaments will depend widely on the time of your stay.